As well as tracking the location of containers of material, the BellHawk JMTS (Job and Materials Tracking System) tracks the transformation of materials. This transformation can occur in a wide variety of manufacturing operations such as mixing, molding, machining, cutting, coating, and assembly. Transformation of materials can occur in warehouses where operations such as kitting, repacking, and labeling occur. It also occurs in repair, refurbishment, engineering, and construction operations. These transformation operations typically start with the consumption of containers of material with one part number and end up with the production of containers of material with another part number. Accurately tracking this transformation of materials is important for inventory control, job costing, and materials traceability. BellHawk tracks the flow of material into and out of operations using a work order, which can have a set of operations attached to it. 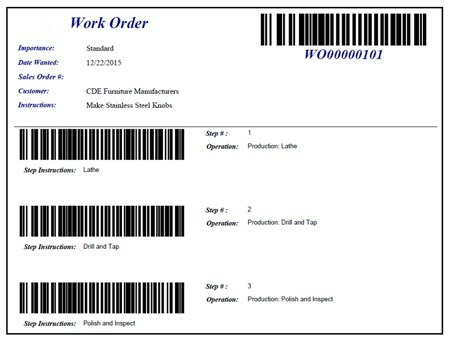 This work order, and its barcoded work order traveler, is the same as is used for tracking when operations start and finish and the amount of labor used. BellHawk tracks materials consumed or processed on each work order step/operation and completed materials our from the final job step. It tracks Work-in-Process (WIP) material transfers between operations as well as containers of barcoded WIP that are awaiting processing. BellHawk can also track scrap materials and rework operations. When scanning materials into a work order operation, the BellHawk user scans a barcode on their badge followed by selecting or scanning the work order and step/operation. They then scan the license-plate tracking barcodes on each container of material being consumed and record the quantity consumed. This enables BellHawk to relieve the inventory of materials consumed. When scanning materials out of a work order operation, the BellHawk user scans their badge barcode, selects/scans the work order and step/operation, records the quantity produced, and then scans the tracking barcode on the containers/items produced as a result of the operation. If the materials produced by an operation are simply moving between operations in a tote or on a cart or trolley, then a permanent license-plate tracking barcode is typically attached to the tote, cart or trolley and this tracking barcode is scanned as the destination of the materials produced by the operation. This WIP material can then be recorded into the next operation by scanning the tracking barcode on the intermediate container. If finished products are produced at the end of the line, then a license-plate tracking barcode is attached to the container, such as a carton or pallet, into which the finished goods are placed. This barcode can be from a pre-printed roll of license-plate barcodes or printed on-demand by BellHawk. The tracking barcode on each container is then scanned as the destination of the finished products. The containers of these products are then entered into inventory and tracked like any other containers of material until they are used on other jobs or shipped to customers . In this way BellHawk is able to relate the materials consumed to the materials produced for materials traceability purposes. It is also able to compute the cost of the materials consumed to make a product as well as the cost of the labor and machine time required, if these are recorded. A separate part number does not have to be created for WIP materials unless required. In BellHawk these are typically given the finished product part number but flagged with a WIP flag to indicate that they are not finished materials and, as such, are not to be included in regular inventory. But at the same time BellHawk is tracking all the containers of WIP materials using its license-plate tracking methods. Bills of material and routes can be stored within BellHawk in a combined Bill of Material Based Routing (BOMBR) tree structure as part of the Item Master records for each item to be made. This is more sophisticated that the more common separate bill of materials and route approach used by many other manufacturing or ERP systems. This stored setup data is then copied to the work order, when it is created to make a specific quantity of the Item thus minimizing the amount of work to create a work order. This BOMBR data enables the materials scanned into a work order operation to be compared with those specified to be used for the operation and the user warned if they are about to use the wrong materials. It also enables BellHawk to generate a report of expected cost versus actual cost to produce products. The BOMBR approach also allows BellHawk to store recipes for mixing batches of product in one step and then to store the packaging materials in another step. The bills of material and routes to make items can be entered and stored in BellHawk or they can be imported from an external system. If stored within BellHawk they can be copied to become the bills and routes for jobs. Alternately the bills and routes for jobs can be imported directly from an external system. Jobs can be initiated within BellHawk or they can be initiated from an external system. 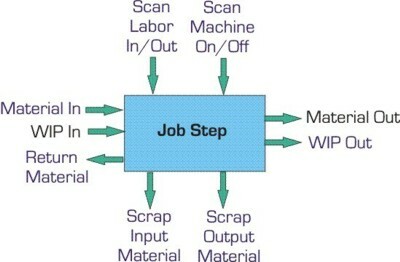 Sometimes the quantity of materials consumed on an operation are not known until the operation is complete. For example a master roll of material may be placed on machine to make products but the quantity used will only be known when the remaining material on the roll is weighed. BellHawk enables the recording of materials returned to stock, including the lengths and widths of off-cuts. BellHawk can also record the production of containers of scrap material produced by manufacturing processes, including those materials that are given a new part number, such as that for scrap metal or paper. This enables these containers to be tracked until these containers are sold or otherwise disposed of. As well as tracking operations where input materials are consumed to produce output materials, BellHawk can also track Assembly, Repair, and Test operations where the items themselves do not get consumed but are tracked through a sequence of operations in which parts, labor, and possibly test stand time are consumed. The original part, however, retains its license-plate tracking barcode throughout the sequence of assembly, repair, or test operations. Please click here to learn more about the Capabilities of the BellHawk Job and Materials Tracking Software.